D-Mannose is a sugar residue that is naturally present in trace amounts on urinary tract cells and can also be found in minute quantities in certain fruits and plants such as cranberries and birch trees. UTI Cleanse now with Cranberry provides a small amount of cranberry with a large dose of d-mannose in both tablet and powder form for your convenience. Primary Uses: UTI Cleanse now with Cranberry helps prevent recurrent urinary tract infections caused by E. coli. E. coli bacteria attach themselves to the residues of d-mannose that are found on the receptors of urinary tract cells. Supplemental d-mannose provides an alternate binding site for the bacteria, which can then be flushed out. D-mannose has earned the enviable reputation of being able to provide results with exceptional speed, often in as little as 24-48 hours in many cases. Together, D-mannose and cranberry provide a superior solution for the prevention and treatment of UTIs. 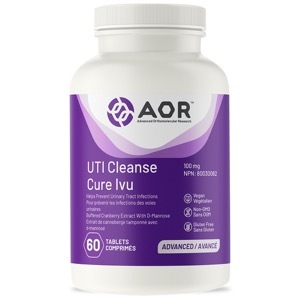 UTI Cleanse now with Cranberry is the perfect natural solution for those with recurring UTIs caused by E. coli, especially for those wanting to reduce their use of antibiotics. Take 1-2 tablets four to five times daily without food, or as directed by a qualified health care practitioner. CAUTION: Consult a health care practitioner prior to use if you are taking blood thinners or have a history of kidney stones. Consult a health care practitioner if symptoms persist or worsen. Avorn J, Monane M, Gurwitz JH, Glynn RJ, Choodnovskiy I, Lipsitz LA. Reduction of bacteriuria and pyuria after ingestion of cranberry juice. JAMA 1994 Mar 9; 271(10): 751-4. Head KA. Natural approaches to prevention and treatment of infections of the lower urinary tract. Altern Med Rev. 2008 Sep;13(3):227-44. Howell AB, Botto H, Combescure C, Blanc-Potard AB, Gausa L, Matsumoto T, Tenke P, Sotto A, Lavigne JP. Dosage effect on uropathogenic Escherichia coli anti-adhesion activity in urine following consumption of cranberry powder standardized for proanthocyanidin content: a multicentric randomized double blind study. BMC Infect Dis. 2010 Apr 14;10:94. Howell AB. Cranberry proanthocyanidins and the maintenance of urinary tract health. Crit Rev Food Sci Nutr 2002; 42(3 Suppl): 273-8. Martinez JJ, Mulvey MA, Schilling JD, Pinkner JS, Hultgren SJ. Type 1 pilus-mediated bacterial invasion of bladder epithelial cells. EMBO J. 2000 Jun 15; 19(12): 2803-12. Klein T, Abgottspon D, Wittwer M, Rabbani S, Herold J, Jiang X, Kleeb S, LÜthi C, Scharenberg M, BezenÇon J, Gubler E, Pang L, Smiesko M, Cutting B, Schwardt O, Ernst B. FimH antagonists for the oral treatment of urinary tract infections: from design and synthesis to in vitro and in vivo evaluation. J Med Chem. 2010 Dec 23;53(24):8627-41. Sauer FG, Mulvey MA, Schilling JD, Martinez JJ, Hultgren SJ. Bacterial pili: molecular mechanisms of pathogenesis.Curr Opin Microbiol. 2000 Feb; 3(1): 65-72. Stothers L. A randomized trial to evaluate effectiveness and cost effectiveness of naturopathic cranberry products as prophylaxis against urinary tract infection in women. Can J Urol 2002 Jun; 9(3): 1558-62. Toyota S, Fukushi Y, Katoh S, Orikasa S, Suzuki Y. Anti-bacterial defense mechanism of the urinary bladder. Role of mannose in urine. Nippon Hinyokika Gakkai Zasshi. 1989 Dec; 80(12): 1816-23. Wright JV. D-Mannose for bladder and kidney infections. Townsend Letter for Doctors and Patients. 1999 Jul; 192:96-98.